WHY SHOULD I JOIN THE ROYAL CANADIAN LEGION? •Social Activities – Our branch has recreational facilities and we have licensed lounges. Members can enjoy a wide variety of social events such as dances, BBQ's, entertainment and a host of other special events. •Member Sports – The Legion has sporting events such as darts, shuffleboard, euchre, cribbage and snooker, with competitions ranging from local, provincial to national levels. 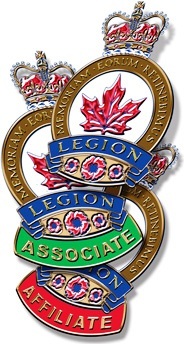 •Member Benefits Package – The Legion has developed a relationship with a number of corporate partners to provide products and services to its members. Some of the partners include a home and auto insurance company, health care services, a credit card company, and an auto club to name a few. Only Legion members are entitled to the benefits offered. •Community Service – You can serve your community by assisting with the many Legion programs in support of youth, seniors, the disabled and others. The Legion also provides bursaries and scholarships to students from Secondary School to the University level and is the largest single supporter of Scouts and Guides in Canada. It is also a major supporter of sea, army and air cadets. •Leadership – You will have the opportunity to grow within this great organization. The Legion needs members who can take on the Leadership challenge. If this is where your interest lies you can become involved by serving on the branch executive. You may even wish to go to higher levels such as zone, district or provincial. You may even aspire to the national level. Every Dominion President who has served in this capacity started out as a branch member. You, too, could one day be President of the largest community service organization in Canada. •Service – As Canada’s largest volunteer organization, tremendous intangible benefits are gained through the commitment of members to fulfill the mandate of remembrance, service to the community and our country. Our fallen comrades served in battle, you have “another way to serve” by joining The Royal Canadian Legion. •Legion Magazine – Your membership includes a subscription to the Legion Magazine which is published six times a year. It contains articles on various topics including history, current events and general interest stories, as well as keeping members up-to-date on the many and varied Legion activities. It also contains a section dedicated to the recognition of those who served their country.